It's a fast-moving, quick-thinking, bluff and banter quiz for family and friends! 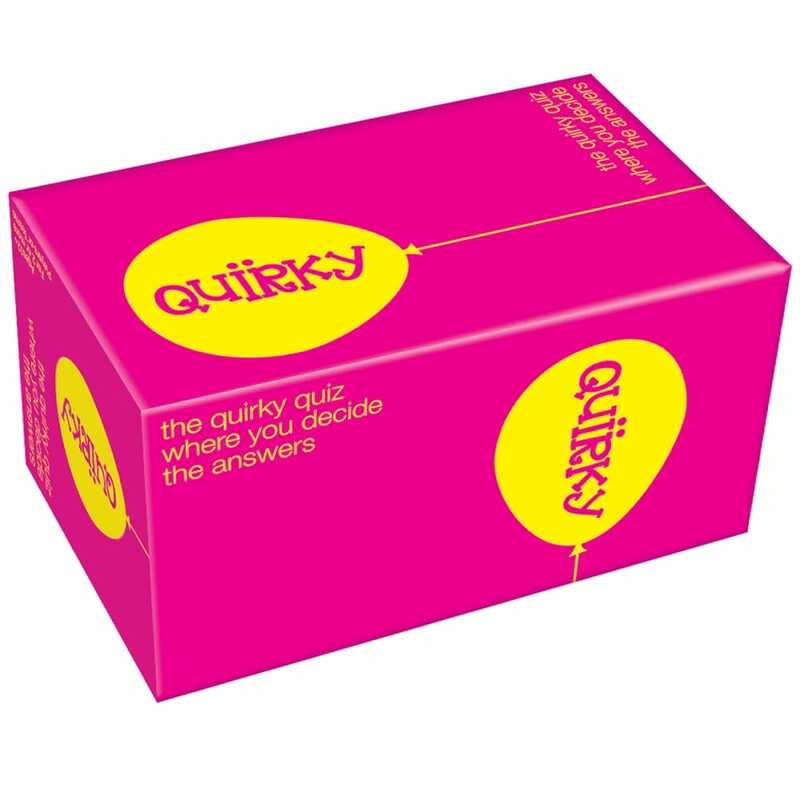 Quick witted and cheeky, confidence is as important as knowledge in this game where you decide the answers! Answer against the clock and if you do not know the answer, then make the others think you do with over 1000 questions to answer. It's great for taking on long journeys and ideal for having a fun night in. There is no time limit you decide how long it will take to answer all the questions, age 10+ and 3+ players. Contents: 288 quirky cards, (1152 questions), die, sand timer and rules. Showing 3 of our total 5 reviews, with an average rating of 5 stars. Read all 5 reviews for Cheatwell Games Quirky Quiz Card Game. When opening the game, the instructions were in Hungarian meaning that we could not understand them and therefore couldn’t understand what to do. Couldn’t find them online so had to rely on the reviews and description which weren’t the most helpful. We loved this game! It's suitable for all ages and myself (adult) and two kids (aged 6 and 8) found it equally entertaining. It requires imagination and quick-wittedness...which can only be a good thing! It's great that you can set your own time limit to the game, and the timer adds a bit of excitement to proceedings. Thoroughly recommended. We love board games and this is an excellent addition to our collection. The questions are really varied and unusual (and, well, quirky!) and lead to lots of cries of 'challenge' and funny debates. We've played it quite a few times but the way the cards are numbered means that questions are unlikely to be repeated, which is important in games like this. It's also easy to play on the move because you only need the box. Highly recommended for families who enjoy slightly noisy, fast paced games and very good value for money.